NEW BEDFORD — The roof of the YWCA of Southeastern Massachusetts got a little bigger Tuesday afternoon.The YWCA’s “Under One Roof” project was a recipient of more than a $1 million with the Supportive Affordable Housing award that will help renovate the building and create eight units of permanent supportive housing for formerly homeless or incarcerated women. Under One Roof will also include a child-care facility. The project will consolidate and unify the YWCA’s administrative, program and residential activities at its South Sixth Street location in a state-of-the-art facility. 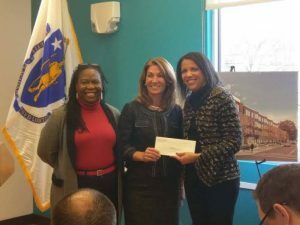 During a ceremony Tuesday in Chelsea, the Department of Housing and Community Development awarded $451,000 in National Housing Trust Fund funding, and $550,000 i n state subsidy to the YWCA. Seven programs from around Massachusetts shared in the $20 million awarded for affordable housing. The new facility will provide a 17,920 square foot addition to the historic Levi Standish House — helping to better serve more than 5,250 women and children in the greater New Bedford area. The addition, Fortes said, is the third and final phase in a $5.2 million renovation process. Fortes said the efforts of Mayor Jon Mitchell, Rep. Antonio F.D. Cabral and Sen. Mark Montigny, both New Bedford Democrats, were instrumental in helping YWCA’s “Under One Roof” project. The addition to the child-care program will allow YWCA to host 50 children in after school programs. Currently, Fortes said the YW provides door-to-door transportation from 13 New Bedford elementary schools to its facility, as well as transportation home. The child-care program is open anytime school is not in session from 2:30 p.m. to 6:30 p.m. — including summer months, professional holidays, even snow days. Fortes said work on the addition is slated to begin in early fall with an anticipated completion date near the end of 2018.